Sliding Screen Doors, Screen Frames, Porch & Window Screens: Apex Products - Sliding screen doors, screen frame, porch screening, window screens. 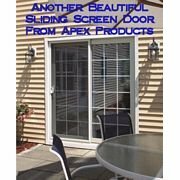 At Apex Products you can shop a wide range of porch screening materials and other solutions for sliding screen doors that will give you control over what comes in and what goes out. Whether you're looking for insect screening to enjoy letting a breeze through without the pests or fiberglass screen mesh that will work for your patio screen door, we have exactly what you need, including replacement screen sliding doors, at prices you'll love. Want to enjoy your porch more with a patio screen door? Looking for sunroom window ideas? How about a heavy duty pet door? There is simply no better place to find these top quality products than Apex Products. Our wide selection of window and insect screening will offer something perfect for your sliding screen doors, windows, and more. 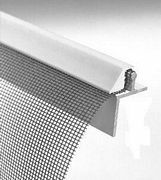 We carry porch screening materials in aluminum, fiberglass, and other heavy duty mesh options for your porch and pool. Our pet screens are durable and made to resist weather and wear beyond your expectations. Shop our products or send us a message for further information about how you can purchase replacement sliding screen doors from our business. Check out these strong sliding patio screen doors and tell us what you think! Choose from 3 heavy-duty extruded aluminum frame styles for your home or RV, including our new coastal sliding screen door packages with stainless steel rollers.